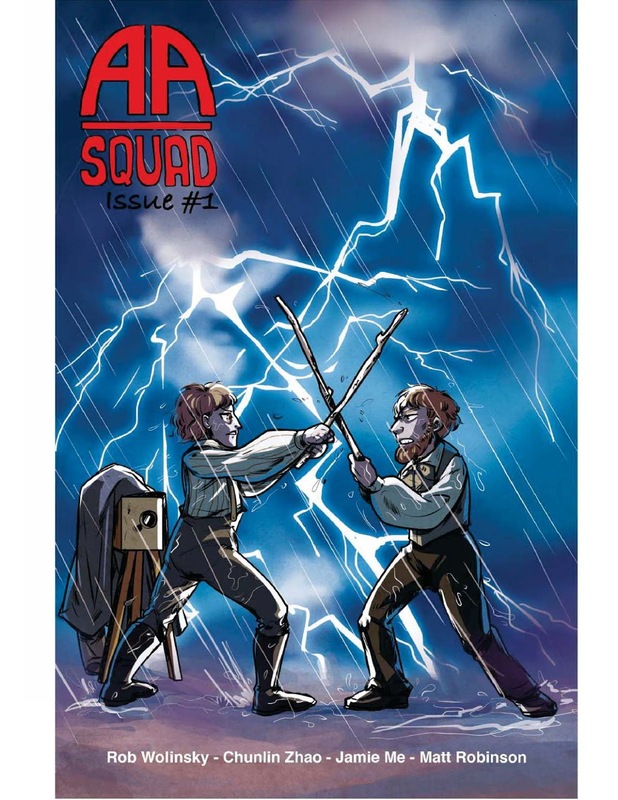 The Fellowship was fortunate enough to obtain a copy of AA SQUAD #1 from Rob Wolinsky. Rob Wolinsky writes, Chunlin Zhao draws and colors, and Jamie Me letters. Liam is a very serious time correction officer who has just been assigned to the “double A” squad. This squad is clearly more laid back than the A Squad, but their next mission arrives immediately – back to 1895 to clear up a small disturbance in the stream. A quick in and out, fix the first film screening in history, no big deal. But something is off in a subtle yet rather obvious way. The setting for this story is a modern-ish day world with at least limited time travel. Assemble a team of brave souls, monitor the timestream for anomalous behavior, and send the team in to investigate and/or repair the situation. These are likeable characters, too, even if they’re a little unconventional (though convention has yet to be established here). And there are a couple of teaser panels throughout (and the ad page is a hoot) adding more depth to the story, as does the very careful, friendly artwork. AA Squad is an independent comic, and it’s a great example of one. It looks great, it blends comedy and drama well, and it begins a cool story in a setting that could easily go on forever (there’s a time joke in there somewhere). It’s definitely worth checking out. AA SQUAD #1 is available now from Rob’s Etsy page, in both digital and physical form.